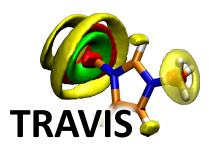 TRAVIS, which stands for Trajectory Analyzer and Visualizer, is a tool which can compute a plethora of functions and histograms from molecular dynamics and Monte Carlo simulation trajectories. It is open source free software, platform independent, and does not require external libraries. The bqb Format is a file format for lossless compression of simulation trajectories, together with the software to compress and decompress such trajectories. It is suitable for both atom positions (standard trajectories) and volumetric data trajectories, such as electron density on a grid (Cube files). In the latter case, a very high compression ratio of up to 35 : 1 is reached. The ORCA MD module is a part of the ORCA program package which enables to run ab initio molecular dynamics simulations of non-periodic systems, using all the different electron structure methods (HF, Semiempirics, DFT, MP2, excited states, multi-reference, ...) that ORCA offers. SANscript ("Scientific Algorithm Notation Script") is an interpreted programming language for scientific purposes, which is currently under development. It is already used as the input language of the ORCA molecular dynamics module. There is no public release of the language definition and the interpreter yet. Here, you can get a first glimpse on the syntax and features of the language.